A few years of accounting work at Sherwin-Williams positioned Chris Cullen for a comfortable career with the Fortune 500 company, his future as bright as the paint giant’s boldest colors. But he wasn’t fulfilled. Cullen had always envisioned himself in a job helping people. He wanted to be a doctor, a healer … somebody who made a difference. “In the hustle and bustle of life, I lost sight of that,” he said. So he turned to Cuyahoga Community College (Tri-C®) to reinvent himself. Cullen — who is serving as Tri-C’s Board Student Scholar this academic year — is midway through his studies in biology and chemistry to earn an Associate of Science degree from the College. 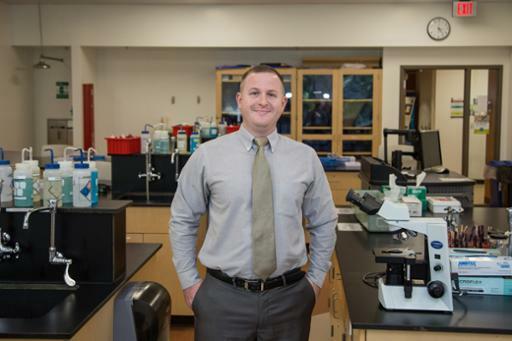 The 32-year-old from Westlake intends to transfer to either Baldwin Wallace University or Cleveland State University in 2019 as the next step toward medical school. Ultimately, he wants to work as an emergency room doctor or surgeon. “I want a job where a good day makes a huge impact and saves lives,” Cullen said. He experienced that feeling soon after starting as a nurse aide at Southwest General Health Center in Middleburg Heights. Cullen responded to a code blue and administered lifesaving chest compressions to a patient in intensive care. Cullen balances shifts at Southwest with a science-heavy class schedule at Tri-C’s Westshore Campus, where he has been involved with student government, The Voice newspaper and numerous events. He is also part of the College’s Honors Program. That eagerness led to Cullen’s selection as Tri-C’s Board Student Scholar for 2018-2019. The leadership position serves as a bridge between the entire student body and the College’s Board of Trustees. Cullen views the responsibility as a way to develop critical thinking and build higher-level skills. In a way, he said that describes his whole time at the College.